I had a pretty sweet childhood. I grew up on a hobby farm where my first pet was a goat, we grew lots of fresh veggies and you grew to realise the scariest animal on the farm is always a goose. Always. One of the main perks of growing up where I did was the proximity to farm stalls selling fresh produce- berries, veggies and my favourite- pineapples. Those suckers fresh from the farm, warm from the sun, felt like a rite of passage for kids in Queensland. So when I started seeing lots of crazy pineapple fabric popping up on my Instagram feed recently I had to get onboard the awesome train. Because what is summer without pineapples? So say aloha to my epic summer of 2014 pineapple shorts! For those not in the know this is the Iris Shorts by Colette Patterns. These are a super simple and super cute shorts pattern with stealth pockets in a side front seam. If you’ve been around the B&P traps for a while you’ve probably seen these pop up like sassy ninjas with lots of me-made tops. To date I’ve made 14 pairs but they’re always relegated to the supporting roles in photos of rad tops. No longer- viva la Iris shorts! Now let’s talk this crazy awesome fabric! This is from Darn Cheap Fabrics in Melbourne and is a lovely linen. Being linen I was thinking it would be a cool and drapey number I could make an epic kaftan from, but alas! This has a heavier drape and needed some serious structure- shorts it is! The inside waistband and pockets are my ultimate polkadot cotton that I use to line most of my makes. It makes my me-mades feel like they’re from a single collection. Fancy! I’ve made the Iris so many times now that all the kinks are smoothed out (not that there were really any to start with). As this version is for summer I added 4cm of length to the leg to give me a little bit more leg meat coverage. Which when I read that sounds peculiar but hear me out. The pattern is drafted for 5’6” and I’m 5’8” so when I’m not wearing tights under these it feels a little “hello, sailor!”. The only other amendments made was to under stitched the waistband and catch stitch it closed. Am I the only one who struggles with stitching in the ditch? It’s such a quick easy make! Less than watching Guardians of the Galaxy on the laptop. Winning! The lack of tweaking I need to fit these. I am almost tempted to turn these guys into wide leg trousers. Craziness! Let’s be honest here. Nothing. I love this pattern so hard. I seriously love my pineapple shorts and see them being on high rotation this summer complete with pineapple based cocktail in hand! And speaking of cocktails, it’s New Years Eve and this lady has a French 75 with her name on it… Wishing everyone a fantastic new year and I can’t wait to see what mischief and mayhem we all get into in 2015. It’s going to be epic! These are pretty freaking rad! I love the extra length in them too. Am still tossing up on whether to make my pineapples into prefontaine shorts, or a graded-up version of the Kelly skirt. I’ve been promised a whole sewing day to myself tomorrow so yay!! Ohhh a kelly could be super fun! Though I love the idea of the Prefontaine shorts! These are the tough choices that have to be made! That print is all kinds of incredible! So brilliant. You look so cool in these! Here’s hoping that 2015 brings you much health, happiness, and a goodly helping of French 75s! OMG you had a pony and a Puerto Rican lizard? Dude! That is so rad 😀 Right back at you for a tops 2015- may it be a rad one! Love love love! They just scream Queensland summer. Maybe you and them should make a little trip to the Gold Coast 😉 I can’t wait to see up my pineapple fabric. Ohhh you got some too? I can’t wait to see your make 😀 I’ll be up Brisvegas way a few times this year so we need to catch up! I LOVE this fabric and I’ve finally gotten my hands on some (winging its way to me from Melbourne right NOW)! Your shorts look great; and I like the length…it’s very classy (and LOVE the polka dot lining). Yessss! I can’t wait to see what you make! I need more shorts in my life. I’m thinking of giving Iris a fling. Maybe I could just steal your awesome pineapple pair. Pineapples are so hot right now! Big fan of pineapples! And a big fan of the Iris shorts. Great make! Thanks, Jen! I’m going to go meta and have a pineapple cocktail while wearing pineapple shorts one day soon! That fabric! I’m dying of textile lust over here! Summer is SO totally for pineapples. These short are both really fun and super chic at the same time. They look fabulous on you! Thanks, lovely lady! Isn’t the fabric the best? Who would have thought pineapples could be so rad! Secondly, totally rad shorts – I love the pineapples, so much whimsical fun!! Perfect summer wear!! Yes! The three of us need to be so hot right now triplets! It is seriously the best, Imogheena! True story: I’m wearing these shorts right now. I think I am addicted! Awesome! I really like the pocket placement. And the fabric looks great! Happy summer (from cold and dreary Germany)! Just found your blog and love what I see. happy new year! 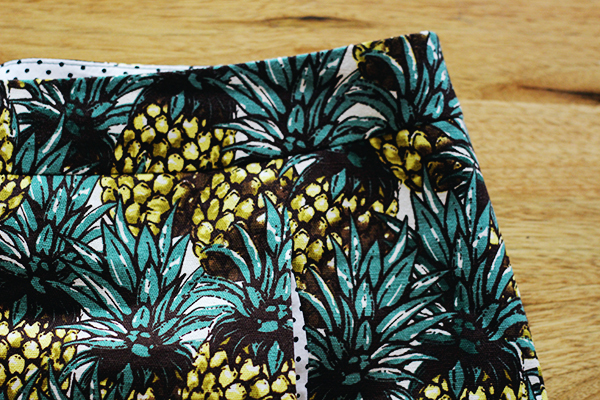 I’m yet to get myself some of this pineapple fabric. It seems every sewer in Australia has gotten themselves a few meters, and i totally want some, cause pineapples are so on trend right now… Anyway. i love those shorts! I have been making summer shorts from vintage patterns, but they dont really fit all that well. too pouffy in the front or they ride up in the crotch. These look so great on you! ill have to give them a try! And to you, Catherine! Seriously get on the pineapple wagon- it is so much fun! Pineapples for the win! You are totally rocking these fruity lovlies. Thank you, lovely lady! Team Pineapple! You should be awarded a lifetime achievement award for services to Iris shorts! These are so damn cool I’m goosepimpled with jealousy. Plus you’re damy straight that geese are pure evil. Nice pineapples Amanda. I too grew up in Qld and just yesterday when I ventured into my Sydney vege patch, there was a smell that took me right back to fruit trees in the yard. It was over ripe figs dripping with ants! Hubby tells me the smell area of your brain is next to location of long term memory. Smells definitely bring back memories for me. Must check out Darn cheap fabrics – thanks. Thanks, Lesley! Ahh the fig tree- smell is truly the most amazing way to recall things. Queensland summers and summer fruit are unforgettable! Also, the shorts are rad-tacular! Good ole Big Bird- he was a terror! And thank ye, lovely! Oh, I’m so envious of all the pineapple loveliness popping up all over the place. Your shorts are fabudabulous! Thank ye, lovely! I have been wearing these so much it is nuts! Team Pineapple!